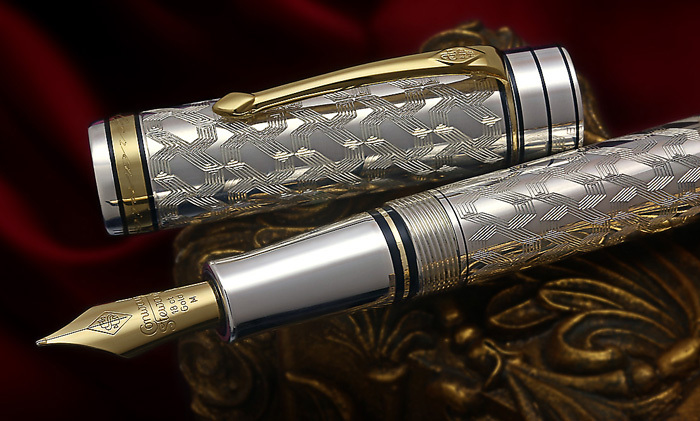 Going back to Visconti’s roots comes the Voyager “Cosmos”, available in three colors. The Black Stardust is a Lava/Resin composite. It has a slightly different feel than normal Resin, but not as tactile as the Homo Sapiens. This material has golden swirls in the pen, when you look at it from different angles they shine, showing the depth of the composite to be quite remarkable. This effect is very difficult to capture in a photographs. 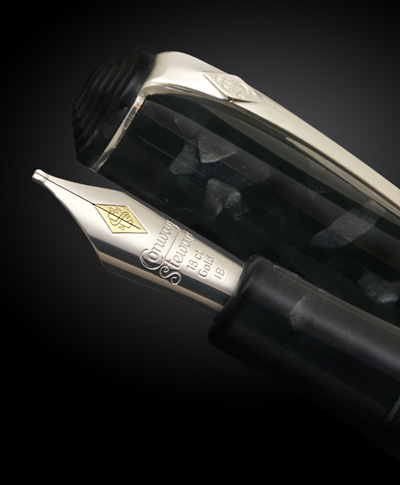 These pens have the older style Voyager Spring Clips and utilize the power filling system, that many writers have come to know and trust from Visconti. The Visconti Cosmos Voyager employs a 23kt Palladium nib, and the nib grades available range from Extra Fine, Fine, Medium, Broad, Double Broad to 1.3 Stub in Visconti’s Dreamtouch 23kt PD nib. Visconti fashioned the Cosmo Voyager with a large wide band around the cap, with “COSMOS” engraved in the front and “VISCONTI” on the back. 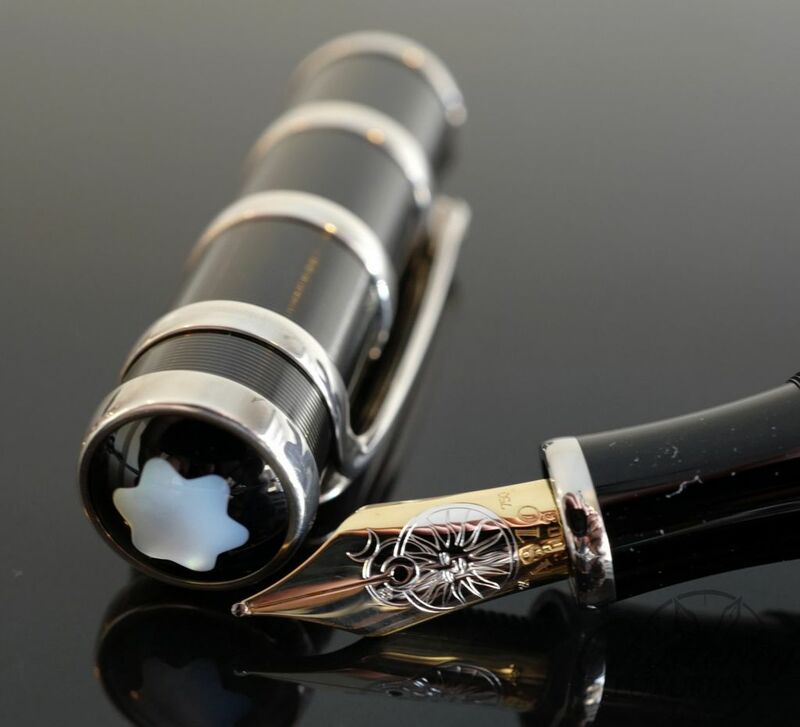 Additionally they have three stately stars fashioned into the ring around the bottom of the pen to represent that this is a US Exclusive Limited Edition of 88 Fountain Pens, and 38 Rollerball Pens. 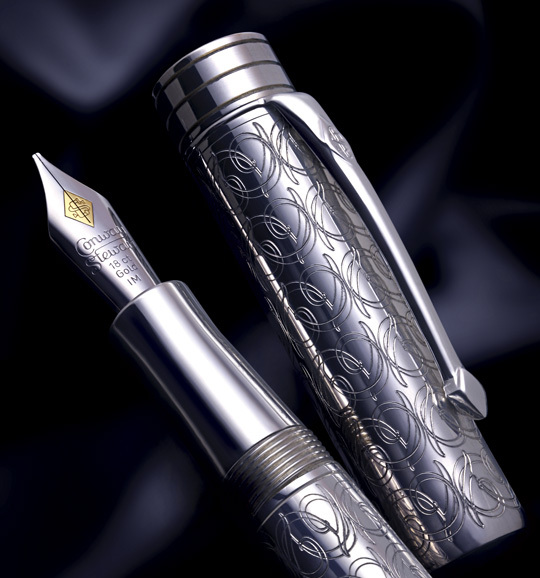 The manufacturers suggested retail price is $695.00 for the Fountain Pen and $395 for the Rollerball.